Twelve new fellows joined the DFM in July. 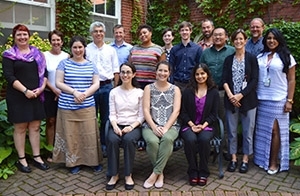 The Department of Family Medicine (DFM) recently welcomed 12 new fellows (who are joining five continuing fellows) across six programs, including its first fellow to specialize in addiction medicine. Molly Rossignol, DO,became the DFM’s first addiction medicine fellow in July. This new clinical fellowship, offered with the William S. Middleton Memorial Veterans Hospital, is one of the first in the country to train family physicians to become board certified in the newly recognized specialty of addiction medicine. Dr. Rossignol is a graduate of the University of New England College of Osteopathic Medicine, and completed a family medicine residency at Central Maine Medical Center in Lewiston, Maine. After residency, Dr. Rossignol joined the faculty of the Dartmouth family medicine residency program in Concord, New Hampshire, and later practiced at Elliott Health System in Manchester, New Hampshire. She was active in the Governor’s Call to Action Task Force Healthcare Section to reduce deaths from drug overdose, lectured throughout the Northern New England region on opioid prescribing and risk for addiction and abuse, and treated many patients in her clinic for addiction. After completing her fellowship, Dr. Rossignol plans on returning to education and academia, and to serve as an advocate for expanding prevention and treatment programs addressing the underlying issues associated with addiction. Thomas Hahn, MD: Dr. Hahn’s academic interests include inpatient teaching, oral health and evidence-based medicine. Suhani Bora, MD: Dr. Bora aims to teach residents and apply integrative medicine’s holistic approach to primary care in underserved settings. Suhani is an integrative medicine fellow. Taryn Lawler, DO: A former Peace Corps volunteer and graduate of the DFM’s Madison residency program, Dr. Lawler has interests in integrative medicine’s holistic, thorough approach to health. Jeremy Johnson, MD, MPH: With clinical interests in the care of sports-related problems in children, adolescents and adults, Dr. Johnson believes that a community’s health can be positively influenced through continuity of care, strong patient and community partnerships, and integrated systems of care. James Conniff, MD: Dr. Conniff’s work focuses on health disparities affecting underserved LGBTQ communities in the U.S. and sub-Saharan Africa. Kevin Thao, MD, MPH: Dr. Thao is finishing his research fellowship and working as a part-time faculty at the DFM-sponsored Aspirus Wausau family medicine residency program. He investigates the impact of chronic diseases such as diabetes, hypertension, and coronary artery disease in the Hmong communities of Wisconsin, and he leads the Wausau Area Hmong Community Health Improvement Project. Rachel Thompson-Fleming, MD, MS:Dr. Thompson-Fleming’s research focuses on improving patient outcomes through modified health care delivery systems, with special interests in environmental justice, vulnerable populations, and global health. Drew Watson, MD: Dr. Watson aims topursue an academic career combining clinical sports medicine with long-term research interests in exercise physiology and public health. Christine Harden, OD: A graduate student in the UW-Madison Department of Population Health Sciences’ PhD program, Dr. Harden’s epidemiologic research focuses on trajectories of napping and wellness across the work-to-retirement transition. During her DFM fellowship, she will explore the role of sleep in the context of mindfulness meditation and acute respiratory illness. Supriya Hayer, MD: Dr. Hayer has interests in integrative health and preventive medicine, especially the role of Ayurvedic herbs in the prevention and management of chronic disease. She is establishing an acute respiratory symptom survey for children, exploring the role of complementary and alternative health care in Wisconsin, and designing a randomized clinical trial to test the efficacy of an herbal formulation for the alleviation of chronic osteoarthritis. Sandy Sulzer, PhD: Dr. Sulzer’s research focuses on the intersections of mental health, CAM and educational research. She has specific interests in the diagnosis of Borderline Personality Disorder and pediatric ADHD in clinical practice, and empathy in medical education.